Western Health supports Family Centered Care. Family centered care focuses on the physical, social, psychological, spiritual and economic needs of the total family. Pregnancy and birth are considered normal and healthy life events. The value of family support, participation and choice is recognized. Families are encouraged to take an active role in their own health care. Our highly trained staff will take you through the birth experience with care and confidence. Western Memorial Regional Hospital is equipped with 11 beds including 5 birthing rooms and a newborn nursery, if your baby requires a higher level of care. Western Health supports Breastfeeding and the staff on the Maternal Newborn Unit have all completed intensive training in breastfeeding to assist you better.See Western Health's Breastfeeding Policy here. Please visit the www.babyfriendlynl.ca for more information on breastfeeding and common baby concerns. See information about Lactation Consultant services here. If you are having a vaginal delivery, two support people are able to be present for the labour and birth of your baby. Staff will inform you when photography can take place. If you are having a Caesarean Section, one support person may be present. The Operating Room staff will let you know when you can enter the Operating Room (OR). Photography will be permitted in the OR at certain times. No video taping or photography is permitted during the actual operation, but is permitted after the baby is born.Your nurse will let you know when you can begin your photography. 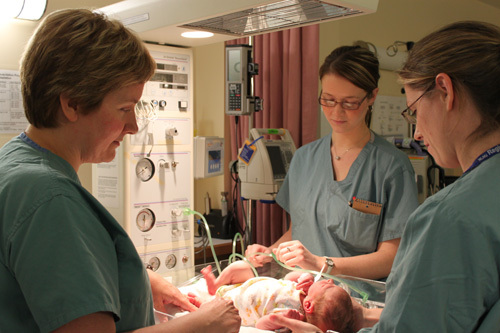 Here at Western Memorial Regional Hospital, the Maternal Newborn Unit is a 24 hour locked unit. Visitors may pick up a phone located outside the unit in order to be granted permissions to enter the unit. An exit button located on the wall before the door allows you to exit when pushed. We encourage all new mothers to choose a support person to stay with them around the clock and take an active role in caring for the mother and new baby. Siblings may visit at any time, accompanied by an adult. If you are in a semi private room, consideration has to be given to your roommate during sleeping hours. For more information about visiting on the Maternal Newborn Unit, please click here. During your stay at Western Memorial Regional Hospital, tour baby's hearing will be screened. If there are any concerns, your baby may require a follow-up evaluation by Audiology. For more information, please see our brochure. Upon your discharge a referral to public health nursing will be sent. A nurse will call you soon after your discharge to speak to you by phone or arrange a home visit.